Times are tough, folks! Want to help me out with production and traveling costs?! Donations are always welcome via PayPal, or via my Patreon website! You may also become a YouTube Monthly Member for extra perks! Today I am bringing you folks a summary of my 3rd outing of 2019. The main objectives for this fishing trip were to scout fishing spots in the state of Delaware, and to search for the Rosyside Dace (Clinostomus funduloides). P.s. hyperlinks for the Smugmug folders of these locations are only accessible to Patreon/YT Members. This section is available for Patreon & YouTube Members only. If you are already a Patreon Member, please check your Patreon Inbox for the hyperlink that was sent out. If you have a YouTube Monthly Membership, please check the community tab for the hyperlink. Today I am bringing you folks a "summary" of my second outing of 2019. To conduct a Species Assessment at the upper Cobbs-Darby watershed. Exploring 3 Creeks for the Waterfall Fish. Today I am bringing you folks a "summary" of my first outing of 2019. To conduct a Species Assessment at the Nameless Pond. Today I am bringing you folks a "summary" of my amazing 5-days Multi-Species fishing trip down in Fort Lauderdale, Florida. I am also linking all the YouTube videos below, in case you folks haven't checked it out yet! To catch as many different Species of fish as possible, in a period of five days. *Lifers. In other words, new species for my list! See my Master Species Album right here. **The Florida Largemouth Bass has been classified as a separate Species; however, the community is still skeptical about it. Thus, I do not count the Micropterus floridanus as a new Species yet. ***Changes in classification or Species identification. All changes were made on the Smugmug Fish Photo Database. The Sand Drum shows up! An unexpected guest makes an appearance...Sigh. A new Species shows up! A rare Species of fish appears! Sabiki fishing for different Species! Punching rocks for different reef Species! *My fellow lifelister Rocky Bangor makes an appearance in these video. Check out his Instagram here. Revisiting the spot for more Species! Live-Lining Shiners for bigger fish! This section will only be available for Patreon & YouTube Members, in the near future. Here is my fishing report for January 22nd, 2018. The 2018 Statistical Fishing Chart was updated as well. My 6th outing of 2018: fishing the Upper Cooper River for Common Carp! Don't forget to watch it in HD quality (1080p60)! If you enjoy watching my YouTube videos, please support the YouTube Channel by subscribing to it! More likes & more subscribes = more time to make videos! My carping friends used to tell me that when it comes to winter Common Carp (Cyprinus carpio) fishing, "preparation is key." And within that process, they always emphasized that the technique of chumming was crucial to attract those big beasts to bite your hooks during the colder months of the year. Thus, after finishing my previous fishing session at the Upper Cooper River in Haddonfield, NJ (last post), I walked a few steps upstream and chummed a whole can of corn in preparation for my next fishing session. I arrived at the same place the next day, around noon. With my Oakley polarized sunglasses, I quickly took a glance at the river. Immediately, I was able to see patches of mud around the area where I chummed. In other words, I knew at that point that there were some fish on my chum. The Upper portion of the Cooper River is always saturated. However, with a nice pair of polarized glasses, one can still see the bottom in its shallower spots. I set up two Baitrunner reels for my carp session: a KastKing Pontus 4000 and a Sharky III 5000. For both reels, I used the Perigee II, 7'0", 2 pieces, medium-heavy with 20lbs Fortis braided line. Since this Species of fish is quite finicky, I used 8lbs Fluorokote (Fluorocarbon) leader on a slip-sinker setup -- a 1 oz. egg sinker with a size 1/0 Riptail rolling barrel swivel and a size #8 Gamakatsu octopus hook. I baited each hook with two-three pieces of canned corn. After casting both setups around the chummed area, it really didn't take me long to get my first bite of the day! Although, it wasn't quite the type of bite that I was expecting. Instead of bending the rod and peeling the drag on the baitrunner, the bite was very subtle. And after it, the line just went slack! Therefore, I slowly held the rod (without moving the sinker), flipped the drag switch, and finally set the hook after the slack on my line disappeared. First Common Carp (Cyprinus carpio) of the day: a ~4lbs fish. After a few shots, the fish swam away strongly. The rest of the day was actually pretty slow. I ended up catching one other small Carp (same bite pattern), and that was pretty much it. On one hand, I was quite disappointed. After all, the biggest Carp that I ever landed in that particular spot was a 10lbs+ fish. In other words, I ended up catching only the small stuff for the day. On the other hand, I was quite pleased that I didn't end up getting skunked. I mean...fishing during the winter months of the year around PA & NJ is never an easy thing to do. Overall, it was definitely a productive day and a positive experience. Even so...I hope I land some giants next time! 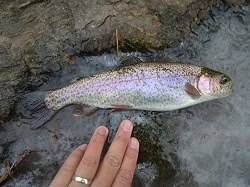 Here is my fishing report for January 21st, 2018. The 2018 Statistical Fishing Chart was updated as well. My 5th outing of 2018: still-fishing the Upper Cooper River, below Driscoll Pond. Don't forget to watch it in HD quality (1080p60)! If you enjoy watching my YouTube videos, please support the YouTube Channel by subscribing to it! More likes & more subscribes = more time to make videos! Every winter of every year, I tend to keep one of my fishing traditions alive: to go micro-fishing for some shiners at the Upper Cooper River in Haddonfield, NJ. The fact is: shiners are just so underappreciated in the fishing community nowadays! After all, they are sold in tackle shops as bait; thus, they have a "baitfish" reputation. But let me tell you something, my fellow friends...when it comes to their sizes, even a chunky Golden Shiner (Notemigonus crysoleucas) can give you a nice bend on an ultra-light setup! Even better -- many Species of Shiners are very resilient when it comes to cold weather. Therefore, they will always be there for your bait -- even when other Species are not willing to bite. Taking that in consideration, I went to the Upper Cooper River with my ultra-light setup for some "shiner still-fishing" action. I arrived at my usual spot -- the bridge, under the Driscoll Pond, around 11:30 a.m.. I equipped my Daiwa Spinmatic Ultra-Light Rod with my Shimano Sedona 500FD and 4lbs KastKing Fluorokote Fluorocarbon line. For my rig, I tied a dropper-loop rig with a size #10 Mustad Hook and a Water Gremlin Dipsey Swivel sinker. My main choice of bait was small pieces of big red worms. First Species of the day: a Pumpkinseed (Lepomis gibbosus). Second Species of the day: a Spottail Shiner (Notropis hudsonius). And I have to say, folks: I was delighted! Heh. Not only I was happy at the fact that my objective of the day was accomplished, but also because the Spottail Shiner is not easily found in the state of New Jersey. In Pennsylvania, this Species can be found pretty much in every little Creek here and there. That includes places like the Pennypack Creek, or the TTF Watershed (Tacony, Tookany, and Frankford Creeks). Even the Poquessing and Byberry Creeks have a healthy population of Spottail Shiner. New Jersey; however, is a whole different story! Per se, NJ already doesn't have a lot of "clear water creeks" in the southern portion of its state -- which by the way, is the prime habitat for this specific Species of fish. Thus, catching one of those in NJ waters is always an accomplishment for a micro-fishing angler! Third Species and second Species of Shiner of the day: a Golden Shiner (Notemigonus crysoleucas). Fourth Species of the day: a Bluegill (Lepomis macrochirus). Sixth and final Species of the day: a Largemouth Bass (Micropterus salmoides). And therefore, I left the spot without any regrets. Another annual tradition was fulfilled. Hope you folks have been doing good recently!